On day three of the 2018 Iowa City Sectionals, two pool records were broken in the men’s and women’s 200 backstrokes. The new pool record holders are Sophia Sorenson (2:13.31) and Cameron Tysoe (1:59.97). After demolishing her seed time in the prelims by almost three seconds, Ames Cyclone’s Sophia Sorenson took the first event of the night in 2:15.30. The future Kentucky Wildcat was 2:13.31 in this morning’s heats, which broke Hannah Ross’s pool record of 2:14.85 from 2011. Coming in second was Audrey Guyett of Saint Charles Swim Team with a 2:16.71, followed by Elmbrook’s Kaylyn Schoof. Both women dropped over two seconds from their entry times as well. University of Kentucky’s Alexandra Nelson (2:18.37), WEST Swim Club’s Jamie Kolar (2:19.12), Aberdeen Swim Club’s Molly Hog (2:21.42), Saint Charles’s Anne Margaret Tavierne (2:21.55) and University of Wisconsin’s Hannah Lindsey (2:22.17) were also represented in tonight’s A-Final. Wisconsin’s Cameron Tysoe picks up his third win of the meet in pool record fashion, going 1:59.97 to win by over four seconds. The former pool record was a 2:01.33 set by Andrew Teduits in 2014. Placing second was Lakeside Aquatic’s Coley Sullivan, posting a 2:04.35 just ahead of third place finisher Daniel Orcutt from the University of Kentucky who touched in 2:04.71. Also competing in the championship final was Kentucky’s Joshua Swart (2:05.03) and Alexander Taylor (2:05.23), Wisconsin’s Stephen Boden (2:06.81), Elmbrook’s Mason Schoof (2:07.74) and Barrington Swim Club’s Griffin O’Leary (2:09.51). After winning the 200 free last night, Barrington Swim Club’s Bridgett O’Leary picks up another gold in the 400 free with a 4:20.45, good for a new Summer Juniors cut. O’Leary was followed by Riptide Swim Team’s Katia Soudakova (4:21.60) barely out-touching Kentucky’s Payton Neff (4:21.84). Lakside Aquatic Club’s Bryn Handley (4:22.84), University of Minnesota’s Abbey Erwin (4:24.33), Barrington Swim Club’s Maggie Graves (4:25.32), Iowa Flyer’s Aurora Roghair (4:26.41) and Saint Charles’s Monica Guyett (4:39.13) round out the top eight. Three men broke the 4:00 barrier in tonight’s A-Final, lead by Kentucky’s Nicholas Smith putting up a 3:57.88 to drop almost six seconds from his entry time. Smith was closely pursued by second place finisher Ben McDade, who came at 3:58.71; and fellow Wildcat teammate Jason Head, who touched at 3:58.95. Joining these men in the final heat was Minnesota’s Nicholas Plaschinski (4:02.39), Dubuque-Area’s Benjamin Colin (4:02.99), Unattached-Minnesota’s Michael Messner (4:05.37), Elmbrook’s Michael Linnihan (4:07.09) and Unattached-Minnesota’s Matt Hedman (4:07.52). Northwestern University’s Calypso Sheridan took gold in the 100m breast in a time of 1:11.77, less than a second off of the US Nationals qualifying standard. Taking second was Minnesota’s Nicole Ciavarella, finishing with a time of 1:12.20. In third was Kentucky’s Elizabeth Merriman with a 1:12.79. Also comprising tonight’s A-Final was Minnesota’s Alexandra Preiss (1:13.12), Greater Des Moines’s Mary Martin (1:13.76), Red Bird’s Jensen Keck (1:14.21), Madison Aquatic Club’s Jenna Silvestri (1:14.38) and Lyons Swim Club’s Callahan Dunn (1:15.39). University of Iowa’s Tanner Nelson completes his sweep of the breaststroke events by winning the 100 breast in a swift 1:03.28. The Hawkeye barely cleared the US National cut by 0.01 seconds. Also making the podium was Unattached-Ozark’s Isaak Webb, who took the silver in 1:03.86. Minnesota’s Brenner Hohenstein snatched bronze with his 1:04.02. Iowa’s Weston Credit (1:04.62), University of Wyoming’s Mitchell Hovis (1:04.90), Wisconsin’s Chris Willis (1:05.03) and Benjamin Attenberger (1:05.70), and Unattached-Iowa’s Caleb Babb (1:06.51) complete the top eight. Iowa’s Kelsey Drake drops a 1:01.22 to take first in the women’s 100 fly. Drake was followed 14 year old Reilly Titmann who posted a 1:01.76 to secure a Summer Juniors cut. Saint Charles’s Mallory Jump narrowly secured the bronze with a 1:02.15. Iowa’s Sarah Schemmel and Delta’s Maxine Parkinson tied for fourth in 1:02.19. Joining them in the top eight was Fox Valley’s Kayleigh Cannon (1:02.74), Minnesota’s Kaia Grobe (1:03.01) and Elmbrook’s Kaylyn Schoof (1:03.15). Fox Valley’s Michael Schwers blew away the field in the men’s 100 fly, putting up a 54.51 to win by almost a full second. 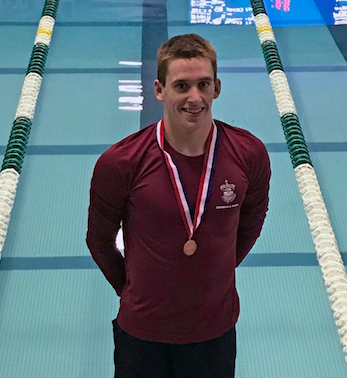 Schwers, who swims for Michigan State University, barely missed the US Nationals cut by 0.02 seconds, largely due to a crunched finish. Taking second was Kentucky’s Joshua Swart in 55.41, followed by Aligator Aquatics’s Michael Balcerak who finished in a 55.67. Two more swimmers in the field cracked 56 in Saint Charles’s Frank Niziolek (55.75) and WEST Swim Club’s Jeffrey Vitek (55.98). Also accompanying these swimmers in the A-Final was WEST Swim Club’s Brank Kosanovich (56.53), Aligator Aquatics’s Michael Petro (56.72) and Reach Aquatics’s Colin Williams (57.01). Also of note, Kentucky’s John Mitchell won the B-Final in 54.96, the only other swimmer at the meet to break 55. Riptide Swim Team got out to a strong lead and maintained through the third leg. On the last leg, however, they were overcome by Saint Charles Swim Team’s anchor Linda Licari who split a 2:05.53 to bring her team the gold in a time of 8:30.12. Riptide settled for second in 8:31.81, followed by Barrington Swim Club who touched in 8:33.16. The lead went back and forth between Elmbrook Swim Club and Fox Valley Swim Team, with Elmbrook leading at the halfway point, and Fox Valley overtaking them on the third leg. With Fox Valley leading into the final leg, Elmbrook’s Michael Linnihan came in clutch with a 1:53.43 to propel his team to gold in 7:54.04. Fox Valley finished in second in 7:46.27, while Saint Charles Swim Team took bronze with a 7:52.45.